The only elected People’s United Party (PUP) San Pedro Town Councilor, Gualberto “Wally” Nuñez has submitted his declaration of financial affairs to the Office of the Integrity Commission. The annual declaration is a requirement for anyone in public life, including politicians, under the Prevention of Corruption Act. Under the act, anyone who becomes “a person in public life” is required to submit a sworn declaration of their assets, income and liabilities for the year prior to being elected, every year for the entire period they are elected and a final declaration for the year after serving as person of public life. 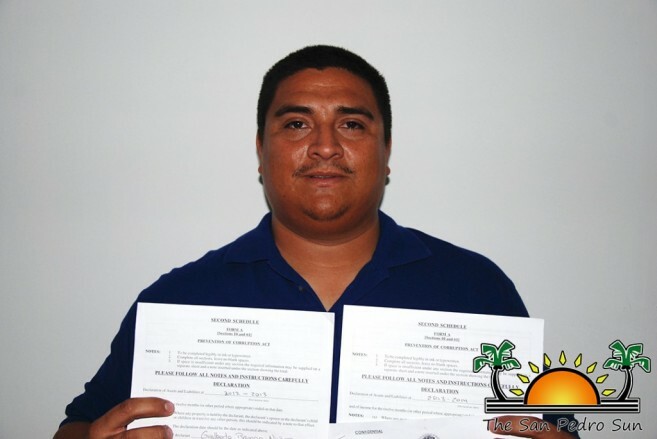 According to Nuñez, it is his hopes that other members of the council and other people in public life follow through with the requirements as mandated by the law in Belize. “By me coming to the media, I am hoping to create some level of awareness about what people in public life are required to do to ensure that we do not foster corruption. I am also hoping that I am not the only one doing it. I also want to challenge every person in public life, even if it is from my same party, to do what is required by law. We need to be clear with the community we serve, open and transparent with our lives,” said Nuñez. This is the second time that the opposition councilor has submitted his financial declaration and so far, it is uncertain if other members of the council have ever done so. “I would also like to challenge other members of the local town council to do likewise,” said Nuñez. The act came into force as of February 2008, however the Integrity Commission has been inactive since 2009. Despite trying to reactivate the commission in 2014, the Integrity Commission remains in hibernation after two of its members resigned in February of 2014 after a new international financial requirement came into effect in Belize. According to the councilor, not only should the other councilors of the San Pedro Town Council be open with their own finances, but the council should also be open with the municipality’s finances. “We have yet to see a financial report from this administration and we are now into our third year of office. The last report we saw was report on what was a left behind by the previous administration,” explained Nuñez. Nuñez also took the opportunity to clarify that the PUP in San Pedro Town has not finalized a slate that will contest the municipal elections scheduled for March of 2015,which was prematurely reported on a local blog. While a Mayoral candidate has been selected, a full slate is yet to be decided upon and Nuñez said that as soon as the party has a final slate, the decision will be made public.